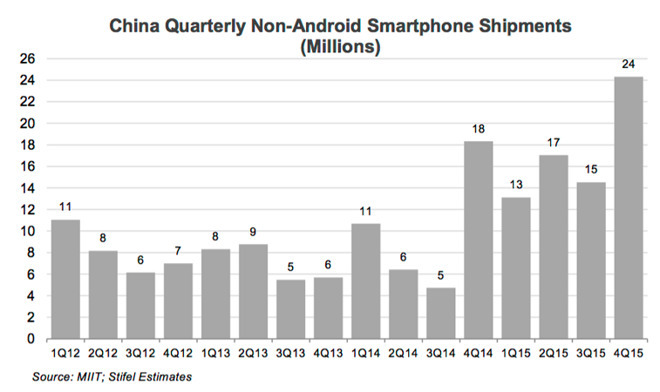 Overall, smartphone demand in China is reported to be falling. A CLSA survey of 350 middle class consumers in "tier 1 and 2 cities" found that only 25 percent planned to replace their smartphone, a moderate drop from the 29.7 percent who expressed a purchasing intent last quarter. CLSA's findings were reported by Shuli Ren of Barrons. China's "city tier" rankings are used by industry research groups and government agencies to categorize regions by their affluence, infrastructure development, economic growth and ability to attract development investment. Apple is targeting tier 1 and 2 cities, including , in its buildout of retail stores in mainland China. However, despite the overall decrease in buying intent, half of those in the study said they planned to buy an iPhone in December, up from 46.7 percent who said the same in September and inline with the 51 percent who planned to buy iPhones in June. Because demand in the overall smartphone market has decreased, Apple's maintenance of a high ratio of intent indicates that it has actually grown over the last six months, in addition to outperforming the overall market the same way Apple has consistently outperformed the shrinking PC industry in selling an increasing number of Macs. 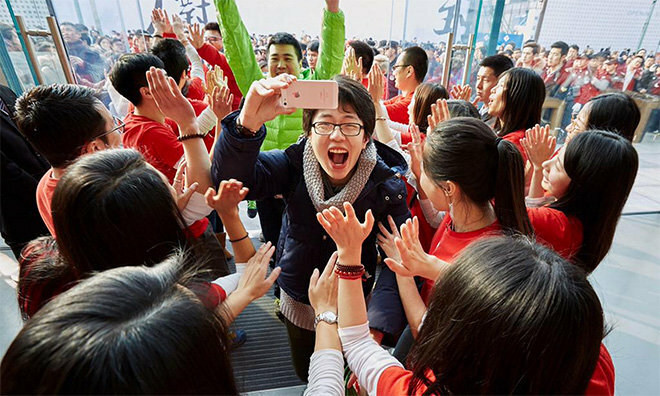 The increase in the number of buyers who said they planned to buy an iPhone in December compared to last summer is noteworthy given that Apple reported a 100 percent increase in iPhone sales in China in the September quarter. Continued consumer interest in Apple's brand has increased primarily at the expense of Huawei (down 1.9 percentage points) and Samsung (down 1.1 points). The report also noted a unspecified drop in intent for Xiaomi. The data also indicated that three quarters of those who planned to buy a new iPhone already owned a smartphone that was less than two years old; 25 percent had bought their existing phone within 2015, and 52 percent had bought a phone in 2014. CLSA analyst David Murphy cited this as evidence of "a loyal following" for Apple in the country. Despite a troubled economic outlook for China's markets, buyers said on average they'd be willing to pay as much as 6,033 yuan (about $915) for an iPhone, a 22 percent premium over the average price of a new iPhone, cited as being 4,953 yuan ($750). CLSA's survey findings support the data reported in parallel by China's Ministry of Industry and Information Technology, which indicated 33 percent growth for "non-Android phones" over the year-ago quarter, reaching roughly 24 million units in the December quarter. Apple's iOS represents 90 percent of the non-Android smartphones sold in China. In September, Apple's chief executive Tim Cook noted that the company was on track to exceed its 74.5 million iPhones sold in the previous December quarter. However, since then a series of supply chain rumors have asserted that Apple would cut orders from its suppliers in the March quarter, inciting a panic surrounding the idea that iPhone 6s sales are troubled. A series of smartphone suppliers have also warned of worse than expected results for the December quarter, but their troubles may likely be linked to another supplier: Samsung, which has itself warned investors to expect poor smartphone performance under increased competitive pressure. Apple has repeatedly warned that rumors of supply chain cuts do not and can not provide a clear picture into the company's operations. Previous rumors floated by the Wall Street Journal and Nikkei of supposed supplier cuts as large as 50 percent did not result in any observable change in the number of iPhones that were actually sold.